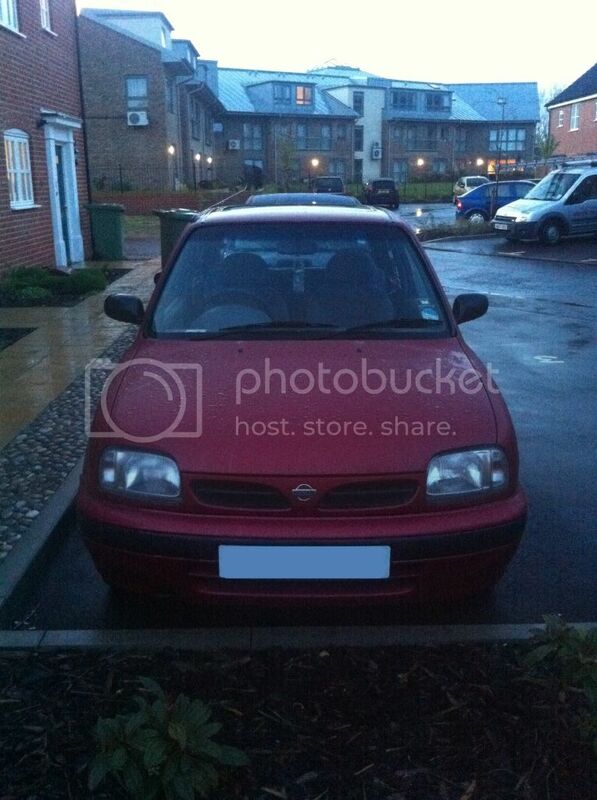 Welcome to my Millie Micra blog! Its hard to believe I've owned her for over 4 years now what really was supposed to be a cheap first car has turned into what it is today just a love for these crappy little cars and I'm lucky enough to work on 2, see I share this love with a fellow member called 'Clodo' Millie and Mildred are like our children so I guess you could call us a family. The first job was to actually see what colour the car was could of sworn it was brown... nope just dirt years of not being washed. The interior was a state I hoovered and cleaned up the best I could at first, further on in the blog you'll see some interior mods that lifted and improved the whole driving experience. So plans I had were smoothing the original bumpers and looking into splitters I wanted the subtle look ideally, as I'm not into huge body kits. This really was the plan... read on for what actually happened. As for ICE a decent cd player (7inch touch screen) and some quality speakers all round (vibe) also put a sub in because why not. The car has been sat on 3 different types of springs in the years I've owned it started with 35mm lowering springs then a custom Matiz setup with chopped springs and Corsa B shocks finally I've done it properly and she now sits on BC BR Coilovers. Go forth and read our story! Full SR Super S body kit, front bumper number plate recess removed and opened up, rear bumper (smoothed) and wrap around spoiler. Nissan march bolero rear import plate surround LED Converted. Import plates front and rear. see i've looked into that and also... is it corsa on the rear? if i was going to do that what would the average drop be? i've now looked into alloys and having looked at a few blogs the 15'' almera gti alloys look nice in graphite gray and would support the subtle look i want for the car. oh i know this is going to sound stupid but im new to this... (can you tell?) i want to put some pics up but iv not got a clue how to do it whats a URL??? confuzzled??? I upload pics, where it says upload file and then click full image. right ok ill have another look on that... the thought of cutting the springs worries me little bit too much and ill have gone and f****d it. the drop on the front of yours looks great i was thinking with the gti alloys 195/45/15 im sure there 195 wide even better if there 185 cant be fussed with worrying about scrubbing. ok let me make this more clear im an idiot and still cant see where it says upload file?? Upload file is the button on the right next to where it says "post reply"
iv got ''post reply'' and more options but nothing that says upload file slightly annoying. it keeps asking for a url. ok so just tried copying and pasting the photo name in to the url thing and i just get a little white box with an ''x'' inside it??? or use the direct link and add the tags after. Well done play around with the options and you can have larger images in the thread itself. THANK YOU!!!! Another quick question? options to make them bigger? then click the add image in the reply box and enter that as the url it will be full size. Have Fun! oh and by the way your car is mint. and in such a lovely colour! i agree about the colour it does look lovely all polished up, however i'm having a hard time trying to find the official name of the colour dont suppose youve got any idea? Well if you look at the data badge for the paint code. then goto halfords or any auto paint place it will have the name on their paint database. probably crimson red or something fancy. looks like cherry to me. maybe someone on here knows the actual name but you can get paint mixed up with just the code anyway. Good luck, and keep the photos coming. then edit your post, and use the insert picture button in the reply box then paste that link in there. im still undecided on what i want to do with regards to styling? Styling is suppose to be all down to you. but that's just me. find your inspiration on the forums. Looks like Cinnebar to me,same as my car is/was.I've got half a litre at work I never used,I'll bring it home & post the paint code & see if it matches yours. Looks good anyway,and a 1.3 so no messing around there.And a GX,power steering & electric windows? Already paid for the induction kit? 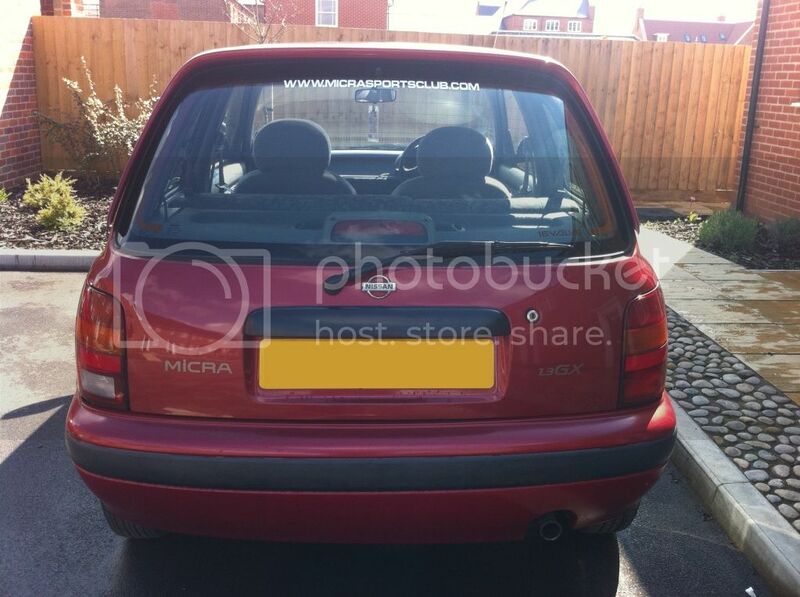 your vibe looks awesome tho the rear bumber i like and will deffo be smoothing mine just based on yours!!! are your rear lights just lightly smoked? the whole rear tail gate will be smoothed, number plate recess key hole, wiper the whole lot and the get a square plate for the back bumper iv seen backlit plates but iv no idea where to get them from? Trouble with smoothed gate is they usually crack if a plate is not welded in close to surface & then you've got to put the number plate & lights somewhere..I've done away with the high number plate light holder & used March (import) lights.This leaves holes where original lights go tho..
Blue turd lol... Scam innit Shaun,$120 for a piece of paper that gets dirty & does nothing for your car! "fitted a peter lloyd 1st cat back system to my k11 yesterday, easy to fit and only £116 plus vat direct from them. fruity "
Good value aint they..wished I'd have known about these before I did a load of money on a stainless system,looks nice but hits somewhere over heavy bumps.It's very tight for space under there when the cars are lowered. just wondering if you've got a photo of the front bumper smoothed as well chap? Front bumper...erm yeah this has been dragging on for years & I will have to at least get it in primer soon & see where I'm at. Sticking with the original bumper get it cleaned and smoothed with a nice splitter. fresh as a daisy after her MOT even the tester said she was immaculate happy days. 16 years and 107,000 miles. Regards to modification news waiting for my 35mm lowering springs, window tint and still trying to sort out paintwork!!! just a random question when you smoothed the rear bumper did you layer over it with fiberglass? or just body filler, smooth it and then paint? weather wasnt too bad here today so thinking... with being on 3 days off work now, removing them bumpers and getting friendly with the sandpaper.